Avatar New York was founded in 2003 by a forward-thinking and technologically progressive team with over a decade of experience in all aspects of the digital environment. Comprised of motorcyclists and programmers, designers and music-lovers, culture-nerds and brainy eccentrics, our diverse team is a powerhouse of ideas and solutions. Avatar New York’s aim has always been to build upon an impeccable reputation of producing sites that straddle the fast-pace of design and technology. We move fluidly with the trends, and introduce concepts that are fresh and accessible. In keeping with this ethic throughout each stage of production, Avatar New York works from the inside out, ensuring that our team’s strategies are reflected in the work we produce. In a sense, our production method creates a rippling effect on the market we serve, imprinting a sense of trust and reliability, which resonates with the public. Avatar New York’s practices have been honed through years of experience, we respond quickly to our customers needs at competitive prices. Here are just a few of our past/current clients: New Balance, Sapporo, Top Chef, Sirius, Yamaha, and Discover Magazine. Avatar New York was retained to streamline New York Water Taxi’s online information and scheduling system and to give it a fresh redesign. With hundreds and thousands of hits per day, commuters and tourists alike rely upon New York Water Taxi for a comfortable and scenic experience. Avatar New York began New York Water Taxi’s redesign process by first creating the information architecture to lead the production process. The easily navigable menu selections on the home page make it appealing to tourists who would be using the service to tour around Manhattan, or look at specific sites around the rivers. For commuters and frequent users, information is a few clicks away. 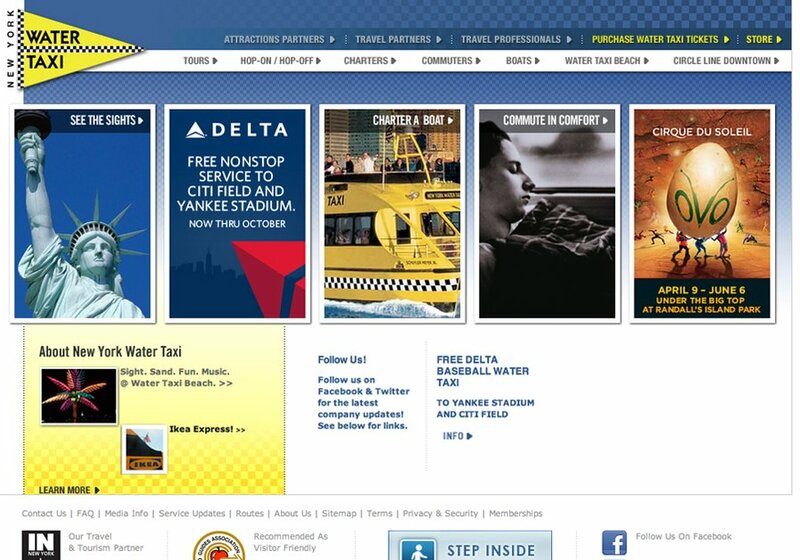 Apart from hosting and designing the site, Avatar New York also offered New York Water Taxi special features such as a Content Management System, an interactive flash-based route map, and an optimized search engine. New York Water Taxi has dropped outgoing costs for an internal customer service team. New York Water Taxi fully manages their routes, tours, and calendar with their comprehensive content management system.